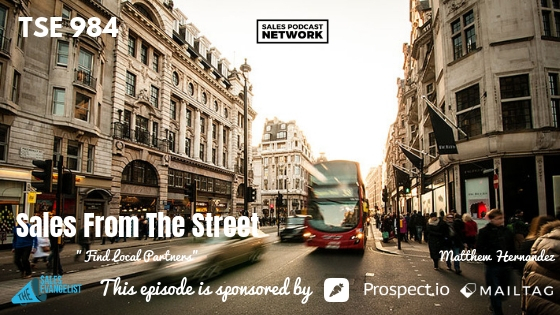 TSE 984: Sales From The Street: "Find Local Partners"
On today’s episode of The Sales Evangelist, we talk to Matt Hernandez about the changes in the marketplace, and how the ability to find local partners has helped him drive more revenue for the businesses he serves. 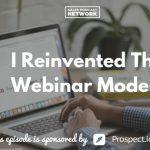 In his work with small-to-medium businesses, Matt has worked to figure out new ways to deal with leads because people have become more resistant to cold calling. He believes that, although cold-calling can work, it must exist in the right circumstances. The key is better lead intelligence. Matt doesn’t struggle with recruiting or interviewing salespeople. The key, he says, is to be very upfront about the challenges of the role and hire the right type of people. Hire open-minded people who aren’t super particular about their activities and who often aren’t as needy. [7:15] They’ll be more coachable. Also be very honest about the type of role you’re hiring for, the challenges it will present, but also the benefits of the role as well. In the past, sellers would have a name and a phone number and they could attack each cold lead with different opens or different hooks. Now, he says, people are numb to that approach. Instead, his company looked to generate inbound leads and lukewarm leads. He does acknowledge that you must make sure the payment is in line with the revenue goals. You must make sure your customer acquisition costs aren’t too high. Matt’s company has seen strong results from the move away from cold calling. He estimates that the effort now accounts for 5 to 15 percent of their deals. He predicts that this kind of effort would likely work in a variety of industries. Begin by listing as on Craigslist in the cities you’re interested in. State what you’re offering and decide ahead of time how much you can afford to pay. In shorter sales cycles, you pay based upon generating contracts. In your ad, provide a range of income that interested parties could generate per month. Then you could interview over the phone or in person or over video. The effort is super cheap, super easy and really scrappy. Seek objective advice and make sure you’re giving your new ideas time to work. If things aren’t going the way you want despite your effort, don’t be afraid to pivot and try new approaches. Be willing to try something different. The marketplace changes rapidly, and technology does, too. You have to be willing to adapt. Think of a small coffee shop competing against Starbucks, who has millions of dollars to spend on advertising. Fivestars has created a software that costs pennies on the dollar because the cost is spread across 10,000 merchants. It’s an incredible solution for anyone who owns a local business with a physical location. Connect with Matt via email at matthew.hernandez@fivestars.com. If you need a way to get more customers in the door, Fivestars works with more than 40 million consumers who use the platform. 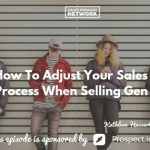 This episode is brought to you in part by Maximizer CRM, a personalized and robust CRM with the capability to organize your company and effectively line up not only your sales, but your client’s success. Go to TheSalesEvangelist.com/maximizer for a free demonstration. We are also brought to you by prospect.io, a powerful sales automation platform that allows you to build highly personalized, cold email campaigns. It has changed the way we prospect. Take advantage of the risk-free trial they offer specifically for the TSE community. First three months at half-price? You can’t beat that! To learn more, go to prospect.io/tse. Your prospecting will never ever be the same.